Cup kings AFC Stanground face their biggest knockout challenge on Saturday when visiting holders ICA Sports in the quarter-finals of the PFA Senior Cup (Ringwood, 1.45pm kick-off). Division One promotion fancies Stanground will start as big underdogs against their city rivals who are flying high in the Premier Division. But Rob Ames’ side have the winning habit and an outstanding cup pedigree on their side, even though they were only formed at the start of last season. Manager Ames said: “Last season we reached two finals. We won the PFA Chalenge Cup and lost in the final of the Intermediate Shield, but reaching the Senior Cup Final would top that. Stanground hope to gain promotion to the Premier Division. They are second in Division One after suffering a four-point penalty for fielding an ineligible player early in the season. 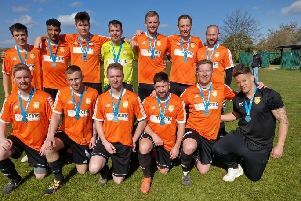 Stanground hope to play at Yaxley FC next season if they win promotion. They hope to develop Lawson Avenue as a top-flight base of the future. Premier Division top two Coates and Oakham clash in the pick of the quarter-finals at Feldale Field. The pair drew 1-1 in a League game in Oakham last weekend after Jake Pell had opened the scoring for Coates. The other quarter-finals see Deeping Reserves host Wisbech Reserves and Netherton United host Pinchbeck.